A dear friend to BYU and its students, President Gordon B. Hinckley (1910–2008) had enduring influence on all who heard him. 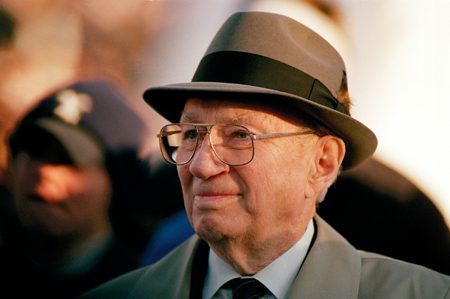 No stranger to BYU, President Hinckley visited campus often, as when he renamed the stadium in LaVell Edwards’ honor. I was surprised by how much his death affected me. Like millions of others, I revered Gordon B. Hinckley as a prophet, I respected his leadership, and I admired his strengths. But we were not personally acquainted, and I knew his time was coming. So when I spoke of his passing with coworkers the day after he died, I was unprepared for the emotions that tumbled out with my words. Later that week I heard a recording of his voice and was again startled by the strong sense that I would dearly miss this great man. As I reflected on the source of those emotions, I realized that President Hinckley had become a familiar presence on this campus during his time as prophet—which has coincided with my time at BYU Magazine.I joined the staff here just four months after Gordon B. Hinckley became President of The Church of Jesus Christ of Latter-day Saints, and in the dozen years that followed, I was a journalistic fly on the wall for many of his campus visits. I was there for devotionals and inaugurations, groundbreakings and dedications, and even a couple of birthday parties. I transcribed his impromptu remarks and edited his prepared speeches for the magazine. I interviewed people about their feelings for President Hinckley, and I spent hours and days and weeks preparing printed tributes in his honor. Years later I sat with two ambassadors from Oman outside President Hinckley’s office in Salt Lake City. With photographer Bradley H. Slade (BFA ’94), I was shadowing the ambassadors during their visit to BYU; next on the itinerary was a private meeting with the First Presidency, during which Brad and I would wait in the hall. After a few minutes, a door opened and the ambassadors were invited in. As they entered the room, we did not see President Hinckley, but we heard his enthusiastic greeting as his ringing voice just escaped the closing door. “What a great voice,” mused Brad, as both of us smiled. To this day neither Brad nor I can recall the exact words of welcome President Hinckley expressed, but we both clearly remember the quality of the voice. Energetic and friendly, cheerful and optimistic, it was a voice that conveyed both warmth and wisdom. It was a voice that lifted others, and it was a voice I had come to love during my time on this campus. So often that voice welcomed and lifted me and thousands of others, just as it welcomed and lifted the Omani ambassadors that day (who emerged, smiling broadly, from the meeting a short time later). It was a voice that made everyone who heard it feel that the owner of the voice was a dear friend, even if they had never before met. It was a voice that welcomed the world, and in its loving welcome, that voice—a far-from-inconsequential thing—made a lasting difference.